Since the introduction of the Offline-Sync mode, many users are wondering how exactly it works, where does it store the synced data and how to access it. This article explains the basics of it. By default, all the items on the drive are Online Only’. Once you click on ‘Local’, the download process of the selected content is initiated. 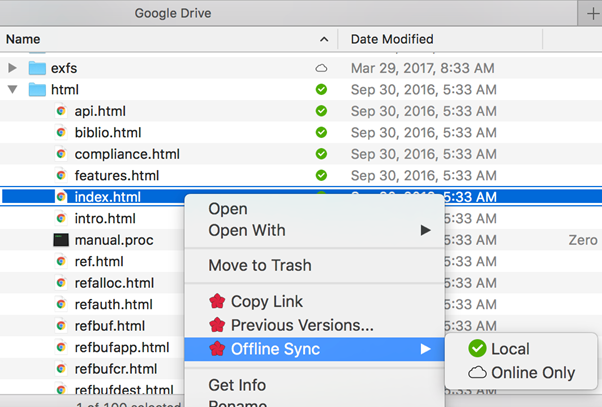 To access the data while offline, you would need to connect the desired drive in ExpanDrive (Google Drive is an example). Starting from v6 ExpanDrive it is possible to connect the drives without having the internet connection. As soon as the drive is mapped, the cached content is revealed. If you make changes to the data while offline, these changes will be synced once the network connection is regained. If you select the content back to ‘Online Only’, the cache will stay for some arbitrary amount of time and then released.